Dukkah is a nut, seed and spice mix from Egypt. The word means to crush and describes precisely how it is made. This versatile mix keeps well and can easily become your emergency magic touch when sprinkled on bread, salads, dips, fish or vegetables. 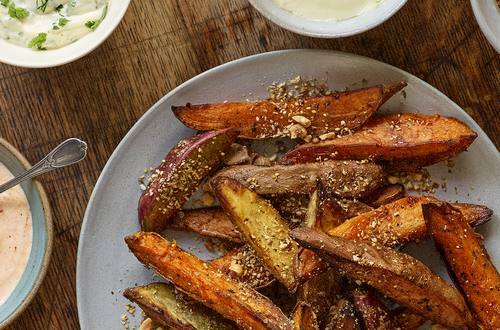 Try double-dipping sweet potato chips first in Hellmann’s ketchup then in Dukkah for an addictive treat. 1 Scrub the sweet potato skins under running water to remove all dirt. Dry well. Cut in half lengthwise, then into wedges. 2 Place on a baking tray line with parchment paper and bake for 20 minutes. Remove the tray from the oven. Raise the temperature of the oven to 230˚C/ 450˚F/ Gas mark 8. When the oven is hot, place the sweet potatoes back in and bake for a further 15 minutes, or until golden and slightly charred on the edges. 3 While the sweet potatoes are baking, prepare the spice mix. In a small frying pan, dry-toast the hazelnuts over medium heat for 4 minutes or until golden. Set aside. Dry-toast the sesame seeds and coconut for 1 ½ minutes or until golden. Set aside. 4 When the nuts and seeds are cold, crush in a food processor, then mix. The consistency depends on your personal taste. You can crush it coarsely for extra texture, or to a fine powder but do not overmix or it will turn into a paste. 5 You can also use a pestle and mortar or roughly chop the nuts and seeds with a sharp knife. Transfer into a bowl, add the spices and seasoning and mix well. 6 Serve the sweet potato chips warm with Hellmann’s ketchup, Dukkah spice and chopped herbs.